Made from breathable, moisture wicking polyester, the ZAN headgear Motley Tube is comfortable to wear in both warm and cold climates. Also the versatility of the Motley Tube allows it to be worn 6 different ways; a beanie, ear warmer, desert scarf, face mask, neck warmer, or balaclava. Ideal for use under a helmet. The motley tube is inexpensive, takes very little room in my saddle bag, and is handy for cold days to keep my neck and chin warm. It also works great to keep my head warm when out camping with the motorcycle. Works great, fits well, inexpensive. 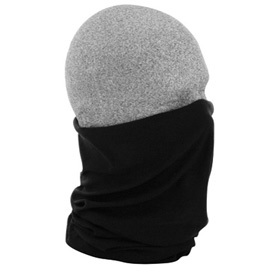 They don't make a claim for it, but also helps keep your face warm on the slightly cooler days. This tube thingy is a very versatile piece of winter riding gear. It's not bulky but keeps the cold air out! I wear it street riding and on the track when it's a cold day. Works much better then I initially thought it would! We got a bunch of these for the family. They keep most of the dust out of your mouth and look fun too. I needed something to go around my neck to keep the velcro from my jacket from chafing and this was perfect. Came in the right color to match the jacket. Looks great and function is spot on. BEST ANSWER: This is 100% polyester.